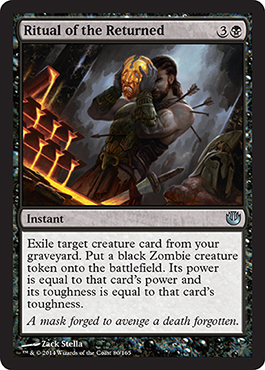 Eric's Review - There are many cards out there for exiling opponents' graveyards, but it isn't a big thing in the current Standard to use the graveyard for much. This seems very specific as if there are supposed to be decks using the graveyard. Bottom Line: Probably won't see much use at all. Devin's Review - I think this card is better put labeled as a 4 mana 2/2 with an enter the battlefield that exiles a players graveyard. To me this card only works for limited and is not even necessary in the format, and all formats that would want this ability their are so many better cheaper options. Eric's Review - Not bad for a cheap enchantment. Boosts a creature, triggers Heroic, AND it gets deathtouch. I like it. Bottom Line: Limited and EDH, maybe Standard. Devin's Review - I like it while it will not trigger any heroic anytime soon, it will be good in some more aggressive black decks in limited. Eric's Review - I like hoplites, and I'm glad we're getting more. And this is a powerful, playable card for a black deck. Bottom Line: Definitely a Standard card and excellent in Limited. Devin's Review - wow just wow, an heroic card that hates on other heroic cards. cheap, aggressive, and possibly playable in standard, i can't wait to draft some weird W/B heroic deck. Eric's Review - I'm not sure I like the name very much. Like Duress, this is a poor man's Thoughtseize, however it acts as one just like a Banisher Priest. Insteresting. 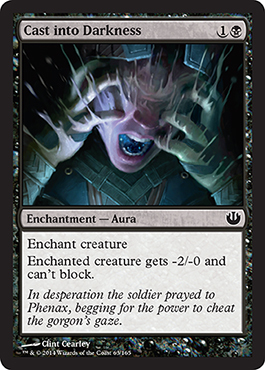 Bottom Line: Might see play in a mono black devotion deck. It's interesting. Devin's Review - Hand disruption is good right now, it has a temporary thoughtseize that can maybe get in on some damage. Playable in standard, Limited, and possibly EDH. Eric's Review - For the name, I expected something more impressive like exiling or just killing a creature. Eh, oh well. Bottom Line: Good in Limited and EDH, not so much Standard, I think. Devin's Review - That art is terrifyingly amazing, but that is about it. Not sure if this is limited playable and not event to think about in standard. Eric's Review - A very nice vampire sort of card giving lifelink and boosting the power. I like it as a card and flavorwise. Bottom Line: This is a pretty good card. I'd put it in my W/B Modern tokens deck and it certainly fits in EDH, Standard, and Limited. 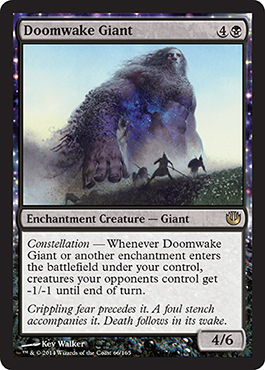 Devin's Review - More terrifyingly amazing art and this one i can get behind in some sort of W/B heroes deck. 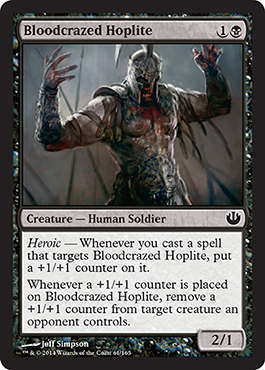 Eric's Review - Well, speaking of my W/B tokens deck, I see a candidate to help speed along my Blood Artist rampage. Also for my Sek'Kuar deck. Seems good. Bottom Line: EDH for sure, possibly Standard, possibly not. I'll use it in Modern. Devin's Review - I feel like this could be good but will probably be bad in standard, but in limited if you like playing black this is amazing and EDH i like this. Eric's Review - Seems like a good sideboard card when going against White Weenies or a token deck in Standard. Doesn't come off as a great card to me. Bottom Line: Limited could be good and I can see its applications in Standard. 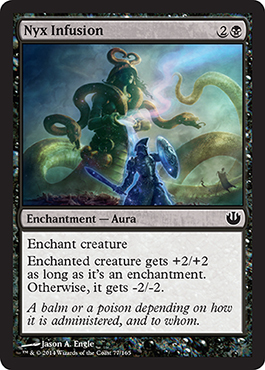 Devin's Review - This is like paying 3 mana for a 4/6 that has whenever an enchantment enters that battlefield do a one-sided shrivel. While yes this card does cost five you can knock the 1B as a shrivel that you don't always need. This is a limited bomb and maybe playable in standard. Eric's Review - It is a bit costly so it probably won't show up in Standard. It has an interesting appeal. Bottom Line: Limited is really the only place I see this fitting in. Devin's Review - That is some nice evasion that will be really good in limited. Eric's Review - Well, control decks have gotten a board wipe, however this doesn't deal with Enchantment creatures. Either way, it's pretty good on its own. 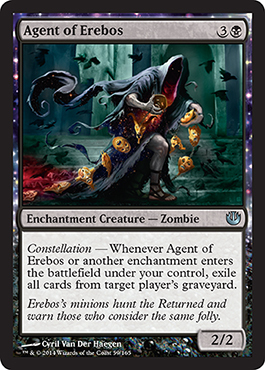 Bottom Line: Control decks in Standard will want this, EDH decks will love this. Eric's Review - And this is a pretty good card that will do exactly what Extinguish All Hope can't. Bottom Line: Powerful in Limited, a strong card in Standard. Devin's Review - Wow a doomblade in theros limited not to shabby. 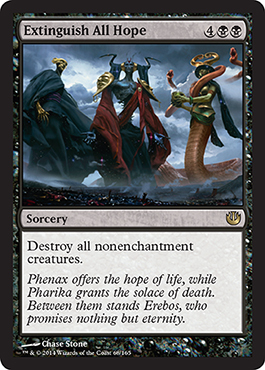 I am mixed about theros removal, i love it because i love playing black in this format, but know that it is very bad for any voltron strategies that this format want so bad to occur. 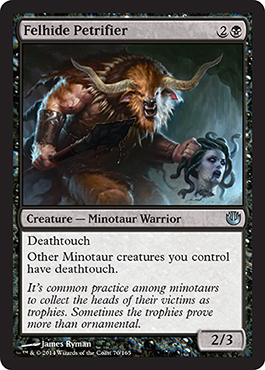 Eric's Review - Well, this goes along with Minotaur tribal by adding a Minotaur that gives all Minotaurs deathtouch. Seems good. 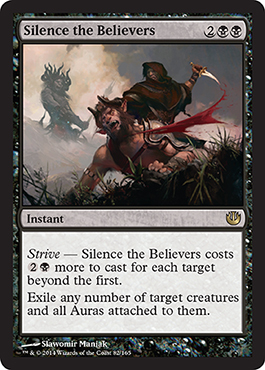 Bottom Line: This could be pretty powerful in the prerelease with the minotaurs available through the rest of the block. Devin's Review - I have been meaning to draft minotuars why not with this guy. Eric's Review - It's not great, but for my Sek'Kuar EDH deck, this might just do what I need. Other than that, not very good. Bottom Line: Found in select decks, but otherwise not so great. Devin's Review - Just bad. Eric's Review - This is pretty good. Strictly better than Tormented Hero, sort of, but only because of Bestow. Seems good. Bottom Line: A decent Standard card and great for Limited. Devin's Review - All i want to do with this card is beat somebody over the head with this guy as they cry and i laugh. 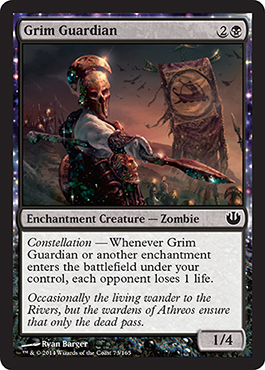 Bottom Line: Could be interesting in Limited, probably won't go far in Standard. 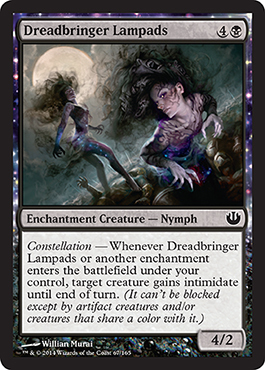 Devin's Review - I really like this high toughness and a decent constellation ability, only playable in limited. Eric's Review - So flavorful you can taste it! Well, sort of. Can't taste anything if it keeps turning to gold, right? 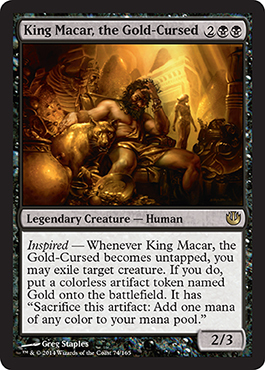 I actually now want to build a White/Black deck with Macar and Brimaz. That'd be interesting, wouldn't it? Bottom Line: Seems pretty good, but Inspired didn't perform too well if I remember correctly. Apply Springleaf Drum for best results. Devin's Review - They made Midas and he is pretty good not as good as he could have been but pretty good. I think this is playable in standard but it needs to find a home. Eric's Review - Well, there has to be a drawback for having a 5/5 flyer on turn 3. I personally like this guy and I'd definitely run him in a deck. Bottom Line: Standard will be interesting. Limited, well, when you see this, you better be the person playing it. Devin's Review - I am in love with this card. While it does have a decent downside this card doesn't care, because by itself it puts your opponent on a 4 turn clock and most likely you will be dead long before that due to what deck would play this card. 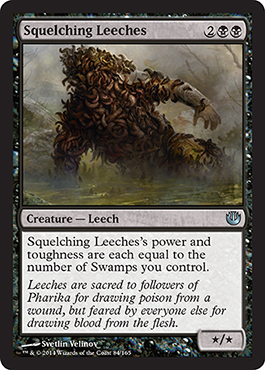 I love this card in standard and in limited this card is just insane. Eric's Review - Interesting, interesting... Works best if you're drawing plenty of cards, but it is a bit costly and only gets used once. Not as fantastic. Bottom Line: Fits in select decks, but probably not in Standard. 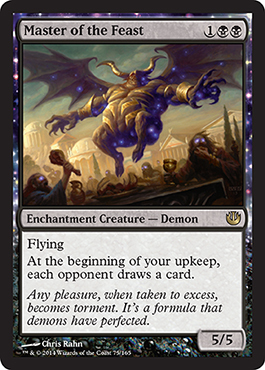 Devin's Review - This card is going right into the taxman EDH deck. though it is really confusing to evaluate in limited though, and is horrible in standard. Eric's Review - Ah, well here we see a perfect example of an Aura that can be pretty beneficial. I like the idea of this, just not sure what to do with this. Bottom Line: Limited for sure, and this will probably make a Standard appearance. I just need to figure the Standard part out first. 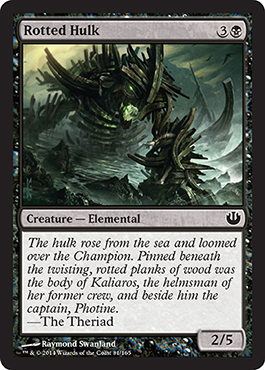 Devin's Review - I really enjoy enchantments that are both banes and boosts because that make them flexible and i can't wait to play this in limited. Eric's Review - Seems like a good turn 1 play. I like it. Bottom Line: Standard, Limited, good pretty much anywhere. Devin's Review - a black sedge scorpion. Eric's Review - Interesting. Incentive to keep it around and it doesn't look like a big threat with such a small power. Seems good. Bottom Line: Limited and could provide interesting choices for opponents in Standard. 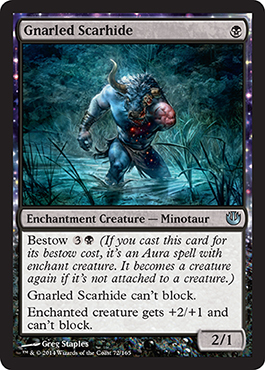 Devin's Review - Returned satyrs look creepy, but this card is horrible in any format. Eric's Review - Ah, this could be pretty good. 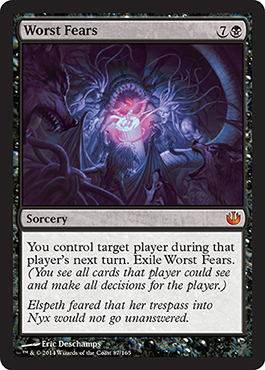 I want to run some sort of graveyard powered deck now just to discard a Worldspire Wurm only to exile it with this. Oh that would be wonderful! Bottom Line: Standard graveyard focused decks. Devin's Review - It is a reanimator spell and not a animator spell at the same time but have no idea what to do with this card in any format. Eric's Review - I supposed this would be considered good in Limited, but it isn't too great outside of that. Bottom Line: Eh... just Limited. Devin's Review - good art with a decent creature so show with it, nothing to be calling home about but not to bad. Eric's Review - Well this is pretty good, I think. With all the auras floating around in Standard, a card like this for Black is really powerful and can turn the tables in a game. Bottom Line: Standard for sure, even if it will just be for control decks. Devin's Review - I have a very strong feeling that post Return to Ravnica Standard is going to be very slow and that this may actually be playable in standard, in limited though this card is pretty good not great but good. Eric's Review - Limited, maybe? Could show up in Standard, but it's too slow. Bottom Line: Limited. Limited is good. Devin's Review - Wow just what limited needed a kill spell with Land destruction tied to it (he says with heavy sarcasm). 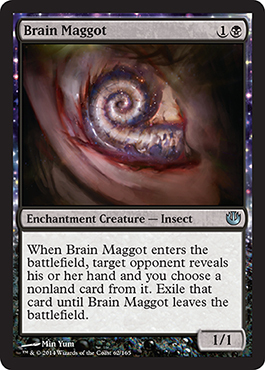 Though i love this card and cannot wait to play this in limited because i am a horrible person. Eric's Review - Yet another card I don't want to think about. Mono black it is! Bottom Line: Standard or possibly EDH mono black decks. 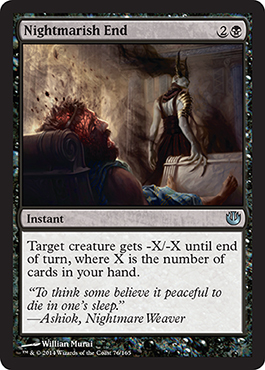 Devin's Review - a Cheaper nightmare that will see play in Mono-Black EDH decks. Bottom Line: I'm guessing EDH would be a place for this to fit in. I don't see this being in Standard. Devin's Review - I do not know what to think of this card. Eric's Review - Well, discarding cards is a thing for sure, and it gives you an advantage, but I've never personally found the appeal. Bottom Line: Decent in limited, decent in Standard, I guess. Devin's Review - Yes great way to use a creature already on the chopping block, sac it and make your opponent discar most of their hand. Limited playable and possibly standard. Bottom Line: EDH I guess. I want to see a limited game where this gets pulled off though. 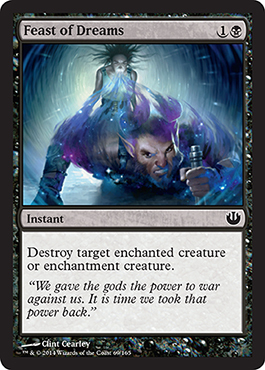 And actually, mono black devotion could easily use this.